Not the first time I've been wrong! "You DON'T really use/EDC/conceal carry your pistol with that hammer "thong" thing on your pistol do you?" No, I don't. I fasten it back out of the way when carrying in that holster. I have a Tom Threepersons holster for all my handguns for sentimental reasons - have been using that design for 60+ years. But I usually carry in one of my more modern holster designs. Answered your PM. Thank You. Very kind of you for taking the time. I think I've figured this out. I get the same thing only it isn't necessarily associated with a jam - it just dents the bullet nose. And yes it can/does seat the bullet deeper in the case. The phenomena occurs when I fire the gun with a full magazine. When the slide moves backwards under recoil it brings the barrel back with it about a 1/4 inch. The bottom edge of the ramp smashes into the nose of the bullet with considerable force. The weird thing is, if I load 7+1, it won't appear on the 2nd cartridge. This is because the way I load the +1. I put a full magazine in, slingshot the slide, drop the magazine and top it off, put the magazine back in. Now since I pushed the top round into the magazine in by hand it is well back in the magazine so the feed ramp will not touch it when it recoils. Once the gun fires, it feeds the next cartridge in just fine. But because the magazine spring puts so much force between the third cartridge and the bottom of the slide, the third cartridge gets pushed forward a little bit as the slide is returning to battery. This sets up the scenario to damage the bullet's nose. Round resting too far forward in magazine, feed ramp and barrel recoils with force, edge of ramp smashes bullet nose. As the magazine empties, it no longer puts enough force on the ammo to cause it to push forward. Now I've been trying to contact Kimber all week and cannot get a response. I sit on "hold" for 5+ minutes at a time. I've emailed. Nothing. Are they still in business? When I first got my Micro 9 and went to the range to put the first 300 rounds through it, this is exactly what mine did with one particular magazine (the factory Kimber magazine). I also went with 2 Sig Sauer 7rnd magazines I had tooled the magazine base pad to fit the kimber. Those two worked fine. But about every 3rd or 4th time with the Kimber Mag, it at a FTF and the nose of the 2nd round hung like you described. 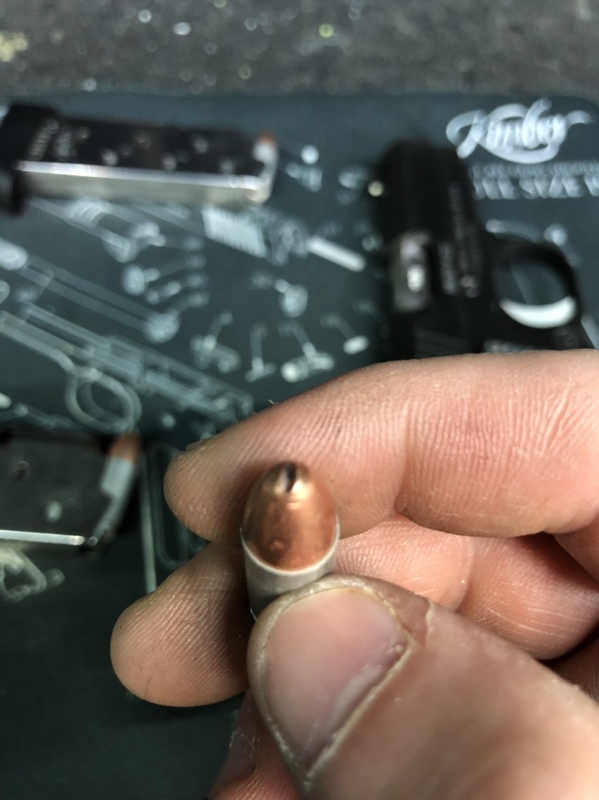 After that day I checked the Sig magazines compared to the Kimber magazine; the Kimber's spring was noticeably lighter as I pushed down on the follower. I called Kimber and they thought it was a magazine issue too and sent me a new one. I took the original Kimber Magazine and stretched the spring (manually) and put it back in. It felt much closer to the Sig magazines after that. 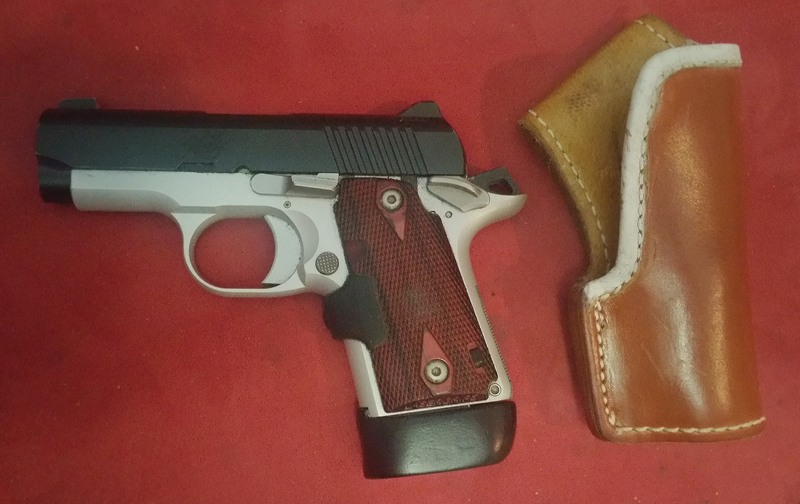 Went to the range w/the new Kimber mag, the old Kimber Mag and the two Sig mags and all went fine. I also polished the feed ramp but I don't really think that helped this issue as the FTF really never made it to the ramp... always got hung on the bottom edge of the feed ramp. All I can say is I stretched the spring in magazine and have put another 300 rounds through and she runs good now. Huh. That's strange. I wonder why a stonger spring would eliminate the problem. I would think it just the opposite. Since it only seems to ding the bullet when the magazine is full, or nearly full, it would seem that when there is more compression, the problem shows up. I thought that because the round underneath the slide is pushing up so hard, that the friction causes the round to slide forward, which puts it in the way of the recoiling feed ramp. So Sig magazines are not drop-in ready? What has to be done to modify? Gotta shave the base pad down a little. Nothing crazy. Pretty obvious too. I hear yanon the spring... hut it seemed to work. I run Sig P290 8-round mags in my Micro 9. They require cutting a new detent slot in addition to modifying the base pad, but they run well. I prefer them to the 7 and 8-round Kimbers. Last edited by JimCunn; 04-15-2019 at 05:42 AM.